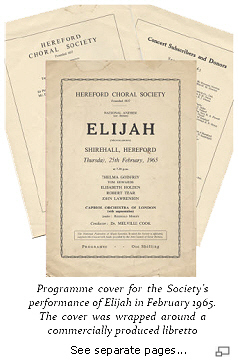 The history of Hereford Choral Society since its foundation in 1837 is, of course, extensive. For its 150th anniversary in 1987, Aneurin Thomas documented this in his highly recommnended book, Con Molto Piacere, copies of which may be purchased from the society. It was with great pleasure that I was able to spend time with Ray Boddington and listen to him recall his time as a member of Hereford Choral Society. We were all greatly saddened when Ray announced his retirement from the Society shortly before we performed Haydn’s The Seasons in March 2008. In doing so he brought to an end a remarkable membership spanning nearly 60 years during which Ray became Concert Manager, Chairman of the Society and also Secretary of the Hereford Three Choirs Festival. As Hereford Choral Society looks towards its 175th anniversary in 2012, it is worthy of note that Ray was a member for more than a third of its history to date and has served under the baton of over half of its conductors in this time! Perhaps a key point in the longevity of Hereford Choral Society is that Ray says that, whilst every conductor has been different, not one of them has had a detrimental effect on the Society and each has brought something that has moved it forwards. 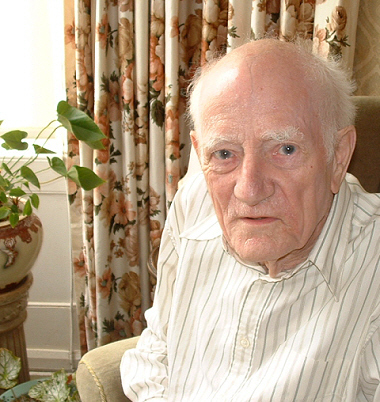 Ray joined the Society in 1949 as a young man returning to his home city and fresh down from Oxford. His first concert was also a milestone for the Society as it was the last under the baton of Sir Percy Hull. This was held in the Shire Hall on Thursday, 10 November and was the concert version of Edward German’s Merrie England, a work that held a special significance for Sir Percy. Sir Percy was replaced by Meredith Davies, whom Ray describes as being a man “full of ideas and with a great sense of humour”. Ray’s second concert with the Society, and therefore the first with Meredith Davies, was Handel’s Messiah. This was performed in the cathedral in March 1950 and had the honour of having Dr H Watkins Shaw playing the continuo eight years prior to the publication of his now definitive edition of the work. Ray says that perhaps the period of most rapid growth for the Society was in the time of Richard Lloyd, who was conductor from 1966 to 1974. Ray had been less active in the Society for a few years prior to this whilst he and his wife brought up their young family, but was now fully active once more. Early in 1970, the winds of change swept through the Society with the departure of Frank Bray and Andy Vincent, of whom Ray has fond memories. In came Dr W H J (Billy) Baker as Chairman, Graham Roberts as Secretary, Alan Taylor as Treasurer and Margaret Whiting as Librarian. John Gilbert requested that concerts were moved to a Saturday instead of Thursday so that members could attend the afternoon orchestral rehearsal – and so began the tradition that still pertains to this day. 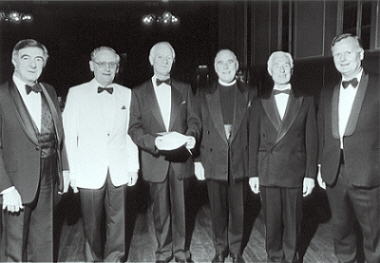 Membership of the Society was around 100 members in 1972 and the chorus performed at the east end of the cathedral nave under the tower. Anyone who has sung from this location will know what an unsatisfactory experience it can be as the sound seems to travel upwards rather than outwards! At this time the Society didn’t possess any raked staging so it was not unusual for some members of the chorus to have no sight of the conductor. Clearly, it wasn’t good for attracting an audience when it was possible for some members of the chorus to be singing from a position with no view of the conductor, having not rehearsed with the orchestra and where they could not easily be heard. Actually, it is plausible that the third of these factors might be advantageous to the audience but was, nevertheless, undesirable! In 1973, Ray Boddington was elected to the post of Concert Manager, a post he was to hold for 10 years. He was aided by pupils of Hereford Cathedral School under the direction of Peter Skinner. Ray was also assisted by the skills of Jim Hyett, whom later succeeded him as Concert Manager. Ray’s innovation was to begin another tradition of positioning the orchestra and chorus at the west end of the cathedral nave and to introduce a facility for raising the gentlemen of the chorus so that they may more easily see the conductor. Our present Concert Manager, Guy Rawlinson, has recently completed a very comprehensive Health and Safety audit for our cathedral concerts, part of which considers the maintenance and installation of our present raked platform. However, in the early 1970s we were untroubled by such things, enabling Ray to borrow plastic-topped tables from the canteen at Wiggins Special Metals, which were arranged such that the gentlemen could stand on them during the concert! Prior to this, audiences seldom exceeded 250, but with innovations such as this and the dynamism of the new enlarged committee, both membership and audience numbers began to rise towards the present numbers of around 180 and over 600 respectively. Another innovation started in 1972 was COMSOC of which Ray was chairman. This was the acronym for the Social Committee (although Ray recalls that Kay Taylor would joke that it was the Society of Communists! ), the aim of which was to allow members to meet together other than at rehearsals and to fund-raise for the Society. It went on to make a considerable difference to the Society’s funds and helped turn them around in under two years. In 1974, Ray strongly recollects that there was to be a concert held in St Peter’s church in Hereford and that it was necessary to transport the conductor’s platform from College Hall. Ray well remembers man-handling the platform on a truck all the way across town for the event. He has similar strong recollections about another feat of man-handling which resulted in him being summoned before the then Dean, Norman Rathbone, for a roasting. This was in the days of Dr Roy Massey’s conductorship when, after a concert, Ray had to move some chairs back into the cathedral. Dr Massey loaned Ray the key to the St John’s door. Being dark, Ray switched on the cathedral lights, but being security-conscious, made sure he locked the door behind him whilst he rearranged the chairs. Ray remembers the furious beating on St John’s door by an irate verger who was demanding to know who was in the cathedral without his permission! Ray was then brought up before the Dean for his ‘telling off’. In 1977, it was necessary to carry out a very quick turn-around to prepare for a concert within 1½ hours after a morning event in the cathedral. The organisation of this was Ray’s responsibility and was very impressively achieved. General Dowson, who ran external events for the Three Choirs Festival, was one of the people suitably impressed and he recommended that Ray be appointed as secretary to the Three Choirs Festival in Hereford, a post he held for twelve years with a further five years as Secretary of the Festival’s Association. After 10 years as Concert Manager of Hereford Choral Society, Ray was finally elected as Chairman of the Society, a post he held for seven years until being replaced by Alan Taylor, Bill Smythe and most recently, Clare Wichbold. 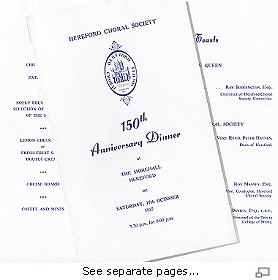 Ray’s tenure as Chairman took in the 150th anniversary of Hereford Choral Society in 1987 and we look to his inspiration as we move towards the 175th anniversary in 2012. When Ray retired from Hereford Choral Society, he didn’t stop singing. He was still active with the Hereford Rail Male Choir and Hereford Police Choir. Ray also appeared on prime-time Saturday night TV with the latter, competing in “Last Choir Standing” on BBC1. Being the most senior contestant gave him the chance to be interviewed by Myleene Klass, as many of us will have seen. Taking part has clearly made a big impression on Ray. However, his big passion was the Marcher Apple Network, which was founded by Ray and a few other people following a chance question about an apple found in a fruit shop in Hay-on-Wye. Since its foundation in 1993 it has grown to an international membership of over 300 people, all of whom share an enthusiasm in reviving interest in historical and local apple varieties. When talking to Ray, his passion and interest for apples comes through in a most engaging way.